Fiction is a powerful medium for communicating deeper truths of human nature and the character of life. Great literature and good cinema can be both educative and inspiring, which is why we are often deeply moved by what we experience in fiction. In the age before motion pictures, literature was considered an essential means for learning about people, relationships and life in general. Whether we like it or not, cinema is the literature of the 21st century, the common medium for depicting the human experience in terms that are universally understood. No matter how outrageous the characters or fantastic the events depicted, there is always an element of truth in the way people act and the way life responds in fiction. Romance Eternal has carefully screen and analyzed a wide spectrum of modern cinema to select stories that bring out profound truths regarding intimate human relationships in a manner that we can easily comprehend. We do not imply that all the events depicted in these movies are realistic, but we do affirm that all the modes and shades of human relationship they represent are true to life. We invite you to discover truths of romance, love, marriage and human relationship in these films, to watch the video clips, read the articles and forum posts, raise questions and respond to those of other readers. Hum Dil De Chuke Sanam Rarely do we encounter instances of pure devotion in human relationships. Love is an ideal and that ideal is founded on a self-less delight in the happiness of one’s beloved. Self-giving is the highest form of human action, because it is to recognize something more important than one’s own egoistic personal satisfaction. Devotional love is beautifully depicted in an extraordinary movie about a woman who is prevented from marrying the man she loves, only to discover that the man she does marry is a living embodiment of selfless love. Vanraj and Nandini’s relationship is a fine example of the powerful bonds of Devotion - Level 8 in the Scale of Romance. See the article and videos. Nandini (Aishwarya Rai) is the daughter of Pandit Darbar, renowned proponent of Indian classical music, living in the Rann of Kutch. Nandini has been brought up with more freedom and education than her siblings, as she is the most beloved of Pandit Darbar. In this carefree life enters Sameer (Salman Khan), a boy of Indo-Italian parentage who wants to learn Indian classical music from Pandit Darbar. Sameer stays with the Darbar family and Nandini is asked to vacate her room to give the guest the nicest room in the manor. Nandini takes a dislike to Sameer, and the two keep playing pranks on each other, but soon realise they are in love. Their love blossoms in the Darbar household around weddings, festivals and family get togethers.Nandini's cousin is unhappily married and comes back from her inlaws place defeated. She is in love with someone else. Nandini and sameer help her to run away with her lover unaware of the consequences. One day, the pair are caught rehearsing their wedding vows and dreaming of their future together. Pandit Darbar is distraught as he trusted Nandini above all. He has already planned Nandini's wedding. Sameer is kicked out of the house and asked never to contact Nandini again as fee for his education(Guru Dakshina). Sameer does not leave India, he stays in town, writes letters to Nandini asking her to join him, but his letters do not reach her in time. Nandini's parents have arranged to get her married to Vanraj (Ajay Devgan) - who had fallen in love with Nandini during her cousin's wedding. He is a simple man, an advocate who blieves in running a truthful life. On the wedding night, Vanraj realises that Nandini is not herself, and tries to ask her why she is not responding to his love ? He asks her for the truth, promising he will help her no matter what. Nandini stays quiet, but is caught reading Sameer's letters when she is alone. He is very angry at first, but later accepts the reality that his wife is in love with another man. He shows the ultimate understanding by taking Nandini to Italy and help her search for Sameer, much to the dislike of his own parents. Nandini and Vanraj arrive Italy and start searching for Sameer but always come up against a dead end. During their search, they face many problems and dilemmas and slowly Nandini gets to see what Vanraj really is like. she sees Vanraj selflessly devoting himself to care for her during her stay in hospital after an incident. Eventually they get news about Sameer (through his mother - played by Helen), and Vanraj arranges for Nandini to meet Sameer, on the night of his debut concert. His job done, Vanraj says goodbye to Nandini and walks away. Nandini and Sameer meet, but Nandini's feelings for him have changed. She reflects on the unwavering love and devotion that Vanraj showed throughout her stay with him, and realises that she loves him. She tells sameer in what esteem she holds her husband and parts with him to go after Vanraj. Watch each of the following clips from the popular sitcom F.R.I.E.N.D.S and answer the respective question. The questions are based on the particular scenario shown and answers should be relate with how you would react if faced with the same situation or what you think is the right thing to do. 1. Chandler and Monica are in love with each other and are recently married. Monica is dominating and wants to have her away and Chandler would rather give in to her wishes than have an argument with her. Chandler has to go to Tulsa in Oklahoma on work for a year and Monica doesn't want to shift as she has landed a great job in NY itself. They have a discussion where she, as always, wants to have her way and Chandler tries to be understanding as to how important it is for her to take the new job. Before Monica says she cannot live without him for 4 days a week, but now the new job offer is tempting. a. Career and money is also important in life as one should learn to be self independent.Monica should argue with Chandler and take the job as its once in a lifetime opportunity. b. Monica should convince Chandler and explain how important this job is to her and why she thinks she should take it. c. Monica should use silent will but let Chandler help take the decision to maintain harmony and show her true love. 2.Monica and Chandler are preparing for their wedding. Monica tries to dominate Chandler when they discuss their wedding plans and always tries to have her way. They have a discussion on the Center peice of the wedding lunch. a. Monica is right. Marriage is important to a girl and she should have her way. b. Monica can discuss with Chandler but convince him to agree with her as she has better taste. c. Monica should sincerely ask Chandler for his opnion and take his views seriously as its his important day too. 3. When Monica and Chandler discuss very important crucial issues, Chandler is very distracted and does not listen. Small issues like these can either be ignored as a minor fault or can be blown up as a big issue. a. Monica has every right to lose her temper in this situation when he is not seriously listening during such an important discussion. b. MOnica should show her displeasure and make Chandler realise his mistake in not listening. c. Monica should not take it seriously as he is just distracted and explain to him patiently how important this discussion is to their lives. 4.Joey is an actor with a low IQ and Charlie is an intellectual, a Palaeontologist and a scientist. Shows how different and opposite they are to each other. She wants a tour of NY and their interests are totally different. They are so opposite in nature and are attracted merely on physical appearances. a. Intellectual and social compatabilty does not matter as long as they love each other. b. Compatability is important, Only if people have similar tastes, harmony will prevail. c. A couple need not be similar but at the same time, complementarity will increase the harmony and romance in the relationship. 5.Monica explains how they celebrated their first anniversary and it shows how totally different they are as people and tastes, but still have a great relationship and complement each other. a.Men are from mars, women are from venus. Just accept that and get along, no point in setting expectations and getting disappointed. b. Men should try and take an effort to show their love and romance with gestures. c. Men show their romance in different ways- it neednt be a romantic gesture, being understanding and supportive by itself is a huge gesture. 6.Discussing about the father of the kid they are going to adopt, Monica and Chandler are not sure if it's a great football player or a convict who was imprisoned for murdering his father. They look at it in 2 different ways, Monica being positive and Chandler being totally negative about it. a. Monica should get annoyed at his pessimism and should argue that he ought to change his attitude. b. She should talk to him convonce him by explaining the need for positive feelings and vibes. c. She should silently send positive energy to him, so that his thoughts and actions reflect an optimism. 7.During the wedding Monica wants to dance with Chandler who actually has 2 left feet. But he really wants to try to make her happy and she in turn wants to dance with him no matter how bad he is. They show their love for each other without being bothered about what people think. b.She is embarrased, but not to appear to have a disagreement with her husband on her wedding day, she dances for sometime and then stops further embarrasement. c. It does not matter what anyone think- what is important is Chandler is the man she loves, So dances with him however bad he is. 8.On their honeymoon, Monica and Chandler forget that they are on a romantic trip and being with each other is all that matters. Instead they try to get freebies and pick fights with the other couple who are on their HM and are so involved with each other that they are hardly aware of other stuff. 2 couples in a similar romantic situation behave so differently. a. One should be practical and free stuff is always good! So romance can wait! b. Romance is important, but given a chance to save money and get goodies, why not take it up. c. Free stuff is materialistic. Honeymoon is once in a lifetime. So romantic vacation is what is important. 9.Rachel tells Ross that she is pregnant and wants to give him the choice of being involved or not. Ross is in such a shock that he acts crazy and is more worried about how she got pregnant than actually thinking of the serious issue of taking responsibility of the baby. a. Rachel should give a him a piece of her mind- One should not tolerate men who cannot take responsibility. c. Responsibility is a big deal for men. So we should give them time to accept and be ready for it. Till then patience is essential. 10.Phoebe tries to and wants to badly impress Mike's parents the 1st time they meet even though they are poles apart. Mike's parents being the uptight elite society of NY and Phoebe being the girl brought up on the streets. a. Keeping to our own class and status is important for any relationship. b. Social differences dont matter, love is what is important and will cross over any barrier. c. One should be judicious in choosing our life partner and accept the fact that there will be practical and psychological difficulties in maintaining a relationship when the background and upbringing is poles apart. If your answer is 'c' for any of the questionsm 3 points for each. 25-30 Very good relationship, Use strategies to raise it to the higher levels. The Painted Veil is a 2006 movie starring Naomi Watts and Edward Norton based on a novel by Somerset Maugham. It portrays a beautiful London socialite's marriage of convenience to a shy bacteriologist and the gradual transformation of their relationship from indifference and dislike into deep and abiding love and affection. When Marriage becomes Romance describes how a woman’s formal marriage compelled by social pressure evolves into a passionate psychological relationship as she discovers deeper human values of goodness and love in the man she married but never loved. See the article and videos. Shallow and lost, Kitty marries the intellectual and passionate Walter Fane, a bacteriologist on leave from the Far East shortly after meeting him at a party. They are so opposite to each other in nature, Walter being an earnest, socially awkward bacteriologist and Kitty, a vivacious and vain London socialite. Kitty enters into this loveless marriage with him at the urging of her domineering mother. Following a honeymoon in Venice, the couple goes to Shanghai, where the doctor is stationed in a government lab studying infectious diseases. Kitty meets Charles Townsend, a married British vice consul, and the two engage in a clandestine affair. When Walter discovers his wife's infidelity, he seeks to punish her by threatening to divorce her on the grounds of adultery if she doesn't accompany him to a small village in a remote area of China, where he has volunteered to treat victims of an unchecked cholera epidemic sweeping through the area. Kitty begs to be allowed to divorce him quietly and he agrees, provided Townsend will leave his wife Dorothy and marry her. When she proposes this possibility to her lover, he declines to accept, and she is compelled to travel to the mountainous inland region with her husband. They embark upon an arduous, two-week-long overland journey that would be considerably faster and much easier if they traveled by river, but Walter is determined to make Kitty as unhappily uncomfortable as possible. Upon their arrival in Mei-tan-fu, she is distressed to discover they will be living in near squalor, far removed from everyone except their cheerful neighbor Waddington, a British deputy commissioner living with a young Chinese woman in relative opulence. Walter and Kitty barely speak to each other and, except for a cook and a Chinese soldier assigned to guard her, she is alone for long hours. After visiting an orphanage run by a group of French nuns, Kitty volunteers her services, and she is assigned to work in the music room. She is surprised to learn her husband loves children from the Mother Superior, and in this setting she begins to see him in a new light as she learns what a selfless and caring person he can be. He in turn realizes she is not the shallow, selfish person he thought her to be when he sees her with the children. As Walter's anger and Kitty's unhappiness subside, their marriage begins to blossom. She soon learns she is pregnant, but is unsure who the father is. Walter – in love with Kitty again – assures her it doesn't matter. Just as the local cholera problem is coming under control, ailing refugees from elsewhere pour into the area, forcing Walter to set up a camp outside town. He contracts the disease and Kitty nurses him but he dies, devastating his expectant wife. Five years later, while shopping with her young son Walter in London, Kitty meets Townsend on the street. He suggests the two get together but she rejects his overtures and walks away, telling her son Townsend is "no one important" when he asks who he is. The Internet Movie Database has information related to the movie, details of the cast and crew, links etc. Official website offers all movie details, links and DVD details. Youtube - Watch movie trailer of The Painted Veil. More often than not love at first sight turns out to be infatuation with an illusion that quickly turns sour or ends in utter disillusionment, like Elizabeth Bennet's brief romance with the handsome, charming, and totally unscrupulous Mr. Wickham in Pride & Prejudice. More rarely an initial dislike or indifference is transformed by closer intimacy into a deep and abiding love and affection as Elizabeth eventually found with Mr. Darcy. A similar transformation is portrayed in The Painted Veil, a 2006 movie starring Naomi Watts and Edward Norton based on a novel by Somerset Maugham. Until recently marriage has been a physical and social necessity for most women and love, a luxury to be pursued in dreams or secret rendezvous away from public view. Kitty's wedding to Dr. Walter Fane was destined to be precisely such a marriage of necessity. Kitty was a pretty but aging socialite with an empty head and trivial interests under pressure to marry and leave the shelter and support of her parents. Resigned to an unfulfilling marriage to a stiff and awkward stranger, she accepted the proposal of Dr. Fane, who sought to marry quickly and carry his bride with him back to his assignment in Shanghai during the 1920s. Kitty quickly became bored of a reclusive life with an introverted physician among the British upper class in China, until she met and began an elicit affair with Walter's friend Charilie Townsend, a handsome, married British diplomat responsible for governing the region. Inexperienced Kitty thought herself in love and believed Charlie was too, until Walter discovered their affair and threatened her with divorce. When Kitty asked Charlie to divorce his own wife and marry her, she quickly discovered that his affections were limited to the time they spent in bed together. In order to escape the public disgrace of his wife's conduct and to punish her for her betrayal, Walter accepted a dangerous assignment as medical officer in a rural Chinese village stricken by cholera. Dragging Kitty along with him, he transported her to a land far from the modern world with even less outlet for her restlessness and her need for trivial amusement. Walter plunged himself into the midst of an unfolding medical tragedy, risking his life every day to nurse dying patients and discover means to stop the spread of the disease. In doing so he won the admiration of the local population, but became more and more estranged from his own wife. Finally Kitty could bear the pain of isolation and boredom no more. She set forth into the disease-ridden town and offered her services at a local Catholic convent run by English missionaries. Encountering disease, danger and death for the first time in her life, she felt the total inadequacy and meaninglessness of her own existence. At the same time, she began to see her husband in a different light, as a man of strength, courage and innate goodness. Goodness was not a quality she had ever prized in a man before, but here in the face of life's most extreme challenges, she came to deeply admire and respect her husband and yearn for reconciliation with him. Fane noticed the change in her and admired her courage in venturing out among the sick. Gradually the barriers of indifference, resentment, and distrust dissolved and they discovered a depth of mutual admiration and affection neither had believed possible for them. In spite of the horrible circumstances, they enjoyed a few moments of intense delight together. Then as the epidemic spread, Fane came down with cholera and eventually died in his wife's loving arms. Kitty returned to London where she gave birth to a son. A few years later, walking in the city she encounters Charlie Townsend. For a moment Charlie's hopes are kindled of another romantic encounter, before he realizes his hope is futile. Kitty is no longer the silly, meaningless spoiled girl he had known in Shanghai. She has experienced life, discovered true goodness and felt what it is to truly love. Fiction is a powerful medium for communicating deeper truths of human nature and the character of life. Great literature and good cinema can be both educative and inspiring, which is why we are often deeply moved by what we experience in fiction. In the age before motion pictures, literature was considered an essential means for learning about people, relationships and life in general. Romance Eternal has selected a range of stories that bring out profound truths regarding intimate human relationships in a manner that we can easily comprehend. We invite you to discover truths of romance, love, marriage and human relationship in these stories, read the articles and forum posts, raise questions and respond to those of other readers. Jane Austen's Pride and Prejudice revolves around the lives and loves of the Bennet family. Mr. and Mrs. Bennet and their five daughters are the principle inhabitants of the village of Longbourn. Mr. Bennet is an intelligent but indolent gentleman. His wife is an energetic, silly woman whose main aim in life is to get her daughters married. The arrival of a wealthy bachelor, Bingley, inspires her with the mission of making one of her daughters his wife. Jane, the beautiful and mild eldest Bennet daughter, attracts Bingley's eye when they are first introduced at a dance. Jane is also charmed by Bingley's pleasant, friendly nature. By contrast, Bingley's even wealthier friend, Darcy, appears pompous and arrogant. When Bingley suggests that Darcy dance with Jane's intelligent and lively sister, Elizabeth, Darcy slights her by replying that she is, 'tolerable, I suppose, but not handsome enough to tempt me.' Lizzie is astonished to hear such censure, but laughs it off with her best friend, Charlotte Lucas. At subsequent meetings, Darcy observes Elizabeth closely and is captivated by her playful manner, fine eyes and clever wit. When he finally decides to approach her for a dance, she turns him down and refuses to hold him in awe because of his wealth and status, as almost everyone else in Meryton does. Sensing he is dealing with an individual of superior character, his fascination for her grows. When Jane is invited to Bingley's home, Netherfield, by his sister Caroline, Jane falls ill and is bedridden there for days. Lizzie goes to Netherfield to nurse her sick sister. She finds being in close company with Darcy unpleasant and is convinced that he disapproves of everything she says and does. In reality, his opinion of her is quite the opposite. Meanwhile, Jane and Bingley become more attached to one another with each passing day. Mr. Bennet's cousin, Mr.Collins, an insensible, foolish young man, who arrives at Longbourn with the intention of marrying one of the Bennet girls. He considers himself an ideal match for any of the girls, since as the only male descendent in the family, he will inherit the entire Bennet estate after Mr. Bennet's demise. Prompted by Mrs. Bennet, Collins selects Elizabeth as the lucky beneficiary of his largesse, though she is far from flattered by this distinction. Besides, Darcy, there is another contender for Elizabeth's affections. A regiment of militia has just arrived in the nearby town of Meryton, and Elizabeth, her younger sisters Kitty and Lydia, as well as just about every other girl in the neighborhood are powerfully attracted to a handsome and charming scoundrel named Wickham. The son of an estate manager, Wickham spent the early part of his life growing up on Darcy's estate, Pemberley, but his relationship with the Darcy family broke down after he turned wild and took to dissipation. Arriving in Meryton and being introduced to Elizabeth, Wickham began to spread false and scandalous tales about how Darcy has deprived him of his rightful inheritance, which she and the general public of Meryton where quite read to believe. His stories captivated Elizabeth and fueled an intense hatred for Darcy. When Bingley holds a grand ball at Netherfield, Darcy finally succeeds in getting Elizabeth to dance with him. She takes the occasion to poke fun at Darcy and insinuate that she knows the truth about his unfair treatment of Wickham. Darcy is enraged, but keeps his opinion to himself. The more she prods and offends him, the more strongly he is attracted to her, but his attraction is overshadowed by his revulsion of her mother and younger sisters' vulgar, embarrassing and unmannerly behavior in public. Fearful that he may be unable to resist his rising passion for Elizabeth, Darcy looks to escape from Meryton. Immediately following the ball, Collins proposes to Elizabeth. She is amused and annoyed by his dogged foolishness. When he refuses to believe she is refusing him, she is forced to turn him down emphatically. Collins is deeply offended by her refusal. Mrs. Bennet is furious and horrified that Elizabeth rejected an opportunity to keep the estate within their family. Collins seeks refuge for his humiliation by accepting a dinner invitation from Charlotte Lucas. The very next day he proposes Charlotte. Mrs. Bennet's sense of disappointment and loss is further aggravated when she learns the next day that Bingley and his party have left abruptly for London. Jane is devastated by news of Bingley's unexplained departure, but doesn't reproach or complain to anyone. Her aunt and uncle, the Gardiners, invite her to London for a change of scenery. Elizabeth soon learns that Wickham is engaged to Mary King who has just come into a fortune, but neither is she devastated nor is she disapproving of Wichkam's mercenary attitude. Three months later, Elizabeth receives an invitation from Charlotte to spend six weeks with her and Collins at Hunsford, where he has been appointed to a lucrative clerical position by Lady Catherine de Bourgh, his overbearing and offensive patroness who happens to be Darcy's aunt. Soon after her arrival at Hunsford, Elizabeth again comes into contact with Darcy when he arrives for his annual visit to his aunt's estate. Darcy is torn between a growing love for Elizabeth and his repulsion of her family and social connections. His passion proves stronger than his reservations. When Elizabeth learns from Darcy's cousin that Darcy was instrumental in separating Bingley and Jane, her dislike for Darcy becomes more intense. Unsuspecting her real feelings about him, Darcy proposes to her in an insulting and boorish manner, taking for granted that she would readily accept him. His proposal comes at a time when she is filled with anger and pain. She rejects him rudely. She accuses him of heartlessly separating Jane and Bingley and of cruelly depriving Wickham of a lucrative position. Darcy is shocked to find his character and integrity questions and to hear himself called ungentlemanly. She tells him in no uncertain words that he is the last man she would ever marry. His intended proposal ends in a violent quarrel between them. Wishing to clear his name, the following morning Darcy writes to Elizabeth explaining in detail the truth about Wickham's character, the reasons for his very poor opinion of her family and his justification for trying to save Bingley from an unfortunate marriage to Jane. Pondering Darcy's words, Elizabeth realizes the truth in his position and the contribution of her own family for Bingley's departure. She now sees Wickham for the scoundrel he is, and feels ashamed of her own foolish behavior. Darcy for his part, recognizes for the first time that he has been acting arrogantly and selfishly. They both depart from Hunsford certain that there is little chance they will ever meet again. Back home at Meryton, Jane and Elizabeth are disillusioned, Mrs.Bennet is depressed, but the youngest sister, Lydia, is filled with excitement by the prospect of going to Brighton to spend time with friend and in the company of the handsome militia officers who have been transferred to a new location. Elizabeth objects to Lydia's going, but her father disregards her warnings and allows Lydia to go. During the summer, Elizabeth is invited by the Gardiners to accompany them on a vacation in Derbyshire, the county where Darcy lives at Pemberly. Hearing Darcy is away in London, Elizabeth and the Gardiners visit Pemberley and are astounded by the magnificence of the estate. the beauty of the place combined with the housekeeper's praise of Darcy stir softer feelings in Elizabeth for Darcy. Just then he arrives unexpectedly. His courteous behavior takes her by surprise. The following days they constantly frequently and she feels much more cordial feelings for him than she has ever felt in the past. Just at the moment when Darcy begins to feel there is hope of renewing his proposal to her, Elizabeth is suddenly taken away by distressing news from home. Lydia has eloped with Wickham, who had promised to marry her. But Elizabeth is sure that Wickham has no such intention, since Wickham needs to marry a girl with wealth to pay off his considerable debts and Lydia has no money to offer. In a moment of utter distress, Elizabeth confesses the dreadful news to Darcy, then rushes back to Longbourn sure that this disgraceful act of Lydia will forever prevent Darcy from renewing his proposal to her. There she finds the who family depressed and anxious for news about Lydia. After a month, they are surprised to receive a letter from Mr. Gardiner informing them that he has negotiated arrangements for Wickham and Lydia to marry and agreed to bear the expense of paying Wickham's debts. When the shameless Lydia returns to Longbourn as Mrs. Wickham along with her husband, she accidently discloses that Darcy was present at her wedding. Unable to imagine how or why Darcy would involve himself with Wickham, she writes to her aunt Mrs. Gardiner for an explanation. Elizabeth is left speechless by Mrs. Gardiner's reply. She has been under the impression that Darcy would find her family disreputable and consequently avoid her. But on the contrary, after her departure from Pemberley, Darcy sought out Wickham in London, convinced him to marry Lydia, agreed to pay all his debts, get him a post in the army, and bear all the marriage expenses. He also insisted on keeping his role a secret, forcing Mr. Gardiner to take the credit. To Mrs. Gardiner it is evident that did it all out of love for Elizabeth. Before long, Bingley and Darcy return to Netherfield back. Bingley is still very much in love with Jane. Now with his friend's approval, he proposes to Jane and she accepts most happily. On hearing a rumor that Darcy is engaged to Elizabeth, Lady Catherine de Bourgh suddenly arrives at Longbourn and attempts to intimidate Elizabeth into renouncing any possible relationship with Darcy. Lizzie is perplexed by the rumor, but resolutely refuses to bow to the lady's unreasonable demands. When news of Elizabeth's refusal reaches Darcy, his hopes of marrying her revive, and he renews his proposal. Elizabeth who has now been waiting eagerly for this, accepts him willingly. Elizabeth's announcement is initially shocking to most, but soon the entire family rejoices with the wedding of two sisters. When a starry-eyed, young Italian woman named Francesca first met Richard Johnson in Naples at the end of WWII, he was not only a handsome American GI who came to liberate her country from the scourge of Fascism. He was also a passport and ticket from poverty and despair to a dream of fulfillment in the promised land. She followed him back to Iowa after the war, where they married and settled down on the Johnson family farm in Madison County. She thought Richard was everything a partner should be -- a loyal, gentle, caring husband, a good father, an honest, responsible, hardworking provider for the family. Together they raised a son and a daughter to adulthood, saw them marry and move on. Then Francesca and Richard spent the rest of their peaceful lives together managing the family farm. That was all her family knew or thought about Francesca for all those decades she lived as a caring housewife and mother, but that was not all there was to her or all there was to tell. Upon her death, she bequeathed to her children a diary that told the tale of another Francesca and another life. It was a tale about four days that told a story that lasted a lifetime. It was the story of a young Italian woman with dreams that soared sky high -- dreams of passionate love and romance. Some 20 years after her arrival in rural Iowa, the dream she had given up when she married Richard arrived at her door. His name was Robert Kincaid, a middle-aged photographer for National Geographic who roamed the world in search of stories and images to fascinate those who could only dream of adventure. He was a carefree wanderer, a loner without home or family bonds. He travelled from port to port meeting fascinating people, liking and loving and carrying fond memories, kind words and beautiful images away with him. He came to Madison County to photograph some old wooden bridges, but what he found and what he left went far beyond the pictures that he took. He discovered a woman of deep feeling and refined intelligence who had locked away the dreams of youth deep in her heart and thrown away the key. Meeting him, those dreams of freedom sprang suddenly back to life. Meeting her, for the first time in his life he felt the irresistible urge for lasting connection and belonging to another person. In a mere four days, while her family was away at the state fair, Robert and Francesca discovered so much of one another and became so closely bound that he felt they were no longer separate people. It was impossible to say who was more deeply altered by their meeting. He was ready to give up decades of independence and she was prepared to walk away from her whole life and family, just so they could remain together. When faced with the choice, he selfishly thought of his own need, but she selflessly thought of the devastating impact it would have on her good husband and growing children. He offered her the world. She had the insight and maturity to recognize that the moment she walked away with him, everything would change. Instead of looking forward with anticipation at a new and unknown future, she would look back with guilt and regret on a life abandoned with ingratitude. The magic of their brief meeting would not survive the humdrum routine of everyday life. Hadn't she dreamed once before and awakened to a less starry-eyed reality? They had met briefly in a common dream and would have to satisfy themselves with the memories of that ecstatic momentary experience. Heartbroken, she chose to remain on the farm. Decades passed. They never met again, but they lived out their lives constantly thinking, dreaming and cherishing one another. After his death she received a box of his most precious personal belongs, including a letter and a book of his photographs entitled Four Days. Did Francesca make the wrong decision by marrying Richard and settling down to a quiet life on a farm? Did Robert suddenly realize his whole path through life had been a mistake? Both seem very unlikely. Human beings are too complex to be reduced to simplistic explanations or formulas of right and wrong. Life is not merely a set of cross-roads, forked paths and missed opportunities. Our needs, aspirations, capacities and potentials are unlimited. Life presents challenges and offers opportunities for the soul to develop some of those capacities, meet some of those needs and fulfill some of those aspirations. Our lives depend on those choices. Had Francesca refused to follow Richard to America, she may very well have ended up as a farmer's wife in the tiny Italian seaport town of Bari where she was born. Or she may have married a drifter, roamed the world and longed for the peace and stability she had foregone. She had chosen instead a path that gave her physical freedom, economic security, social acceptance and psychological well-being. But it could not exhaust the longings of her soul which are infinite. Robert arrived in the mid course of her life to show her all she had missed and reignite the unfulfilled longings deep inside. He awakened a romantic love in her she had never felt before. He made her realize that she was more than the sum of her present life. Indeed, we all are. However much she was tempted, she knew she could not walk away from all life had given her and all she owed in exchange, in order to fulfill a romantic longing for freedom, adventure and romance. She had needed and wanted love and security and found it. Now Robert helped reawaken a part of herself that lay buried beneath. She felt more alive and infinitely richer for that experience. She discovered a part of herself she had not known or had long forgotten. Robert left, but that part remained with her. What is this feeling, this experience that gripped two mature adults and shook the very foundations of their lives and personalities, never to be forgotten? It is romance. The meeting of a complementary personality who awakens dormant aspects of our own personality and touches us deeply at points where our routine life does not delve. That touch may be felt positively as an expansive opening of our being or negatively as an unwanted exposure of hidden attributes. Either way, it is intensely alive and it can be life changing. Confusion arises when we conclude that a person who raises this intense feeling in us is necessarily the one who can bring us the greatest happiness and fulfillment in life. That is not necessarily true. Romance is an adventure that requires constant risk and perpetual self-giving. Comfort, security and possessiveness have nothing to do with true romance. Robert was correct when he said that this type of relationship happens once in a lifetime. That is not because opportunities for love and self-giving are rare, but rather because we rarely give that expansive, unconditional opening to life and other people. Francesca and Robert found four days of intense, ecstatic romance, because they accepted one another as they were without wanting to judge or change anything to make it different or better and because they gave themselves to one another without asking or expecting anything in return. Few people are capable of accepting another with that purity and totality. Fewer are capable of giving themselves without asking for anything in return. By the end of their brief romance, they both painfully and urgently wanted more, but they chose instead to settle for dream they could remember always. They had discovered the truth that romance and marriage do not often go together. The value of an experience can best be assessed by its consequences, rather than in the heat of the moment when emotions overtake us. What were the consequences of their four days together? Even though they never met again, this experience imparted a deeper meaning and value to their lives. It made them feel more alive and caring. Perhaps it made Francesca a more affectionate wife. When her children learned the truth after her passing, it affected each of them profoundly. Her son realized that he had not sufficiently appreciated the woman he married or tried hard enough in his relationship with her. Whereas her daughter realized that she had submitted to the humdrum routine of marriage and stopped trying to discover more purpose in her own life. Francesca’s dream lives on in her children. Was there something unique about Robert that enabled he alone to awaken romance in Francesca or could she have awakened the same romantic feeling in her relationship with Richard or someone else? The person, the timing and the circumstances facilitate the awakening. She had come to the age when her children were grown up and preparing to leave, so a search for new meaning was natural. Had she tried consciously, she might have discovered greater richness and meaning in relating to her children as openly as she related to Robert, or in taking up a career to challenge her intellect and sensibilities, or in striving consciously to become a more giving wife. Richard was a good-hearted man, but physical and unsophisticated. Yet had she tried to discover his own suppressed needs and aspirations, she may have made his life a heaven on earth and blossomed in the process. Their social environment also played a role in the outcome. We learn how Lucy Redfield has been condemned and outcast by the small town mentality for having had an extramarital affair. Francesca could not help thinking how her relationship with Robert would be viewed in a similar light. Recognizing their common bond, she broke the local boycott and became fast friends with Lucy, yet still waited several years before disclosing the secret of her own affair. Had Robert lived nearby she may never have responded to him or her response may have quickly dissipated by fear of social condemnation. The fact that he came and then left helped her keep alive the dream. 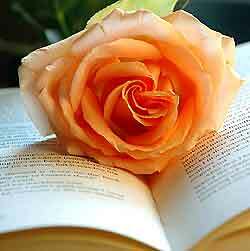 There are many possibilities, but the essential truth is that we discover romance in ourselves. The other person only facilitates that discovery. We all may long to experience it and dream of living it, but how many of us have the strength and courage to live always unprotected, exposed and vulnerable, to give all we are to another with no assured returns of any kind? Those who are capable of that attitude can discover romance in any relationship, because the romance lies within themselves. Those that are not may wander the globe finding new partners in every port, but never finding the treasure that lies within them. The highest state of romance is one of inexpressible wonder, novelty and adventure in which love becomes absolute, unconditional and universal, and life thrills with the marvel of a divine mystery. It is an ever-expanding state in which wanting, taking, demanding, expecting, and possessiveness cease to exist. Ecstatic joy is the true hallmark of spiritual romance. That ecstasy can be attained only through total self-giving and self-forgetfulness in which the lovers are lost in the moment, oblivious of everything but love. The intensity of spiritual romance may be too great and lofty for human relationships to sustain, but it is possible for lovers to elevate their relationship to that level in peak moments that become life changing and unforgettable. At those rare moments one senses that everything that happens to us is an essential experience on our path to fulfillment. Spiritual romance is at once the highest and the most intense of all romantic experiences. It fills the mind and heart with ecstatic delight and saturates the nerves and body with honey-like sweetness. The relationship between Radha and Krishna crosses the boundary between the human and divine, elevating human emotions to the spiritual plane and expressing the utter purity and ecstatic delight of the spirit in human life. In the Bhagavata Purana, Krishna is depicted as the divine child, the avatar born on earth and raised as a cowherd in the forests of Vrindavan. The lovely Gopi milkmaids are his childhood playmates with whom he gambols and on whom he is constantly playing mischievous pranks. Of them all Radha occupied a special place, feeling for him a passionately devotional love of pure and complete self-giving and surrender. 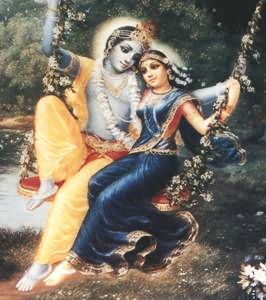 Young Krishna’s life in the forest with Radha, calling to her with the heavenly music of his flute, is a symbol of life as a miraculous divine play, lila.